Beat the Blahs – Paint! It’s a great time to update your home’s interior paint palette! Changing the color of your living room, kitchen, bedroom or bath can brighten a room, give old furniture new life, and even redefine an existing living space. You can completely redecorate or just change the color her and there. Painting is a great way to bring in an entirely new look without a lot of fuss and disruption. While it’s true that paint is a fantastic decorating tool, we tend to forget that the original reason for painting a home was to protect it against the elements. That goes for outside elements like wind and rain as well as indoor elements like… children and pets! Paint resists staining and damage from finger smudges, kitchen grease, as well as general wear and tear. Like taking your car in for a tune-up, repainting is a “tune-up” for your home that protects your investment. In general most rooms need a new coat of paint every six to ten years. To keep your home in top shape, look around and ask yourself a few questions. If you say “yes” to one or more of the following, it’s time to repaint. Is the ceiling cracking, chipping, or peeling? Do the walls look grimy or greasy? Does the color look dull or filmy? Do you have any water damage on the walls or ceiling? Once you’ve made the decision to paint, a contractor can help you decide what color and what kind of paint is best. Using deep, rich colors in large rooms makes them appear smaller. Using light, soft colors in a small room suggests spaciousness. A room facing north or east can be made to feel warmer using rose- or peach-tinted shades of white. Also, rooms facing south or west can be made to feel cooler with green- and blue-based whites. If the area to be painted is covered with wallpaper, it must be removed first which can be a messy and time-consuming job. The walls must be washed to remove any paste or wallpaper residue. Only then can the walls be prepared for paint. The oil-based (alkyd) paints are used less and less for residential interiors and exterior painting. For most interior wall applications, a latex paint has many advantages. When painting trim, latex offers a finish that is non-yellowing. Latex also dries faster and can be cleaned up with just soap and water. Whether you decide to paint the whole house, a room, or just a single wall, repainting will improve your emotional and physical environment. When done correctly, a quality paint job will bring enjoyment and increase the value of your home. This entry was posted in Newsletter on June 9, 2014 by madmin. During the interview use the Contractor’s Checklist. There are many ways to find a reputable contractor. Ask your friends and neighbors or your local paint store manager for recommendations. If you visit a home and you especially like the work, get the name of their contractor. You might also look for advertisements in the local newspaper or the yellow pages. Check licenses and references for each potential contractor. Before you pick up the phone, sit down with your spouse or a good friend and think through your project. Write down exactly what you want done, which colors and sheen you’re after. Also note any of your special concerns, for example, an antique table that needs to be handled delicately. When preparing your preliminary time line, expect a waiting period of several weeks from the time you choose your contractor to the actual start of the project. Now you’re ready to solicit two or three bids for the work you need. Make sure you provide identical information to all bidders. Notice if the contractor returns your call promptly. Does he arrive on time to evaluate your job, and does he provide a written estimate shortly after the initial visit? As more people move into the city from the suburbs, the value of your home increases – and so does the demand for contracting work. As a result, less experienced contractors have surfaced who are also less than reliable. 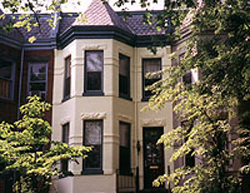 A Capitol Hill resident hired someone to replace her roof at a cost of $10,000. Shortly after the job was completed, the roof began to leak. The contractor could not be found, and she had to hire another contractor for even more money to repair the mess left behind. Once you get your bids, review them carefully. Discuss the bid in detail to make sure you understand the reasons for any potential price variations. A low bid is not always the best bid. In fact, an attractively low bid which supplies sub-grade materials or labor can easily become the most expensive bid in the end. A city resident spent $20,000 to repoint the brick façade and sidewall of his home. Several years later, he decided to paint the outside of the house when he discovered that the repointing was done incorrectly. Because the mortar was literally falling out, he spent $27,000 more to have his house repointed correctly. The most time-consuming and labor intensive part of the quality paint job is the preparation work. This prep work will make the difference between a paint job that lasts one year or ten. When selecting a contractor, ask them about the specific surface preparations they will perform. Scraping, sanding, caulking and patching usually represent more than half of the work. When you have the bids in hand, compare apples to apples. That means compare the same grade of materials and the same procedures. This includes the area to be painted, the number of coats to be used, the grade of paints and similar preparation steps. Know that the contract protects both you and the contractor. Get all promises in writing and spell out exactly what the contractor will do. If you intend to do some of the work yourself, or have another contractor do it, write these qualifiers into the contract. Never sign a blank or partially-completed contract. Obtain a copy of the signed contract for your records. The financial terms should clearly indicate the total price, the time of payments, and the procedure for canceling. Never pay full price up front. Finally, be sure to ask for a copy of the “Renovate Right” pamphlet if your house was built before 1978. There are laws pertaining to lead but not all contractors or homeowners are aware of the requirements. Contractors working on homes constructed prior to 1978 must have completed a specific course approved by the EPA and received certification from the EPA. Ask your contractor for their EPA certification and which of their employees are certified. Our National EPA Certification of being a Lead-Safe Certified Firm is NAT-50531-1. A District resident hired a contractor to remove paint from the house exterior. Five workers used propane torches to illegally heat and remove the lead paint. These workers didn’t practice safe procedures, they didn’t use the proper breathing apparatus, and they didn’t take any measures to protect the adjoining properties. As a result, their grinding and sanding creaded leaded dust which literally covered entire yards nearby. A toddler was among the neighbors who were exposed to lead hazards. One neighbor notified the appropriate authorities, and the District shut down the job for unsafe practices. Fortunately, the toddler did not suffer lead contamination; but the contracting homeowner bore the sole responsibility and cost of hiring a lead-hazard abatement company at $1,200 per day. Taking the time to plan your project, ask questions, and check references pays off handsomely in a job well done! This entry was posted in Articles on June 5, 2014 by madmin. • Are you licensed and bonded in the District of Columbia and Virginia as a home improvement contractor? • Do you carry worker’s compensation as well as public liability insurance? It’s the law; and we carry both. Did you know that most injuries result from step-ladder falls rather than extension ladders? In Maryland a few years ago, two men were working at a height of less than 20 feet when their ladder board fell. One man died and the other broke both of his legs. If the contractor did not have insurance, the homeowner would have been 100% liable for the accident! That’s a painful lesson in checking for insurance coverage! If your contractor employs day laborers or sub-contractors, make sure they all have insurance. • Do you offer a warranty or any guarantees? A contractor who is confident about his work has no problem offering guarantees. 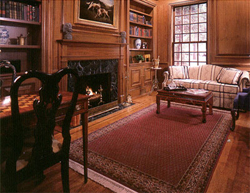 The David Mahoney Painting Company offers a three-year warranty on all work performed. • Does your proposal detail the specific work and time lines? • Do you have references in the neighborhood (DC and Virginia) whom we may contact? Advertising in a trusted local newspaper doesn’t mean the contractor is reliable. You’ll save money and much more when you check references as well as inspect work which the contractor has already performed. David Mahoney can supply you with many satisfied customers you can call as well as former jobs you can actually visit. Like anything else, a contractor who has been in business a long time has the experience necessary to do a better job. David Mahoney has been painting for over 37+ years, and his company has been in business since 1996. David has a proven track record that he’ll be happy to share with you. This entry was posted in Newsletter on June 5, 2014 by madmin. Deciding to paint during the winter months not only means less expensive prices but can also mean you will find a larger pool of available contractors from which to choose. There are many ways you can find a reputable contractor to do your work. Ask friends, neighbors or your local paint store manager whom they would recommend. If you visit a home where you especially like the work, get the name of their contractor. You may also check advertisements in the local newspaper or yellow pages for phone numbers. But just because you see an advertisement in a local publication doesn’t mean the company or individual meets the criteria to engage in the work legally. Check licenses and references of each potential contractor. Before you pick up the phone and dial, sit down and think through your project. Write down exactly what you want done, select colors (or possible colors) and sheen you desire. Write out any special concerns you may have, such as a piece of antique furniture that needs to be handled delicately. Be sure to include a proposed timeline. You can expect a waiting period of up to several weeks from the time you choose your contractor to the actual start of the project. You are now ready to solicit two or three bids for the work you need. Make sure you provide identical information to all potential bidders. Notice if the contractor returns you call promptly. Does he or she arrive on time to evaluate your job, and does he or she provide an estimate within a reasonably short period of time after the initial visit? While the exodus from the suburbs into the city has increased the value of your house, it has also increased the demand for contracting work on the older homes in the city. As a result, less experienced and fly-bynight contractors have surfaced. During the interview use the Contractor’s Checklist. Once you receive bids on the price and duration of your job, review them carefully. Discuss the bid in detail to make certain you understand any variations in price. Just because a quote is an appealing low price does not mean it is the one you should necessarily choose. A cheap bid that sacrifices materials and experience could become more costly than you ever imagined! Painting is the easy part of the job. When selecting a contractor, be sure to quiz him on the surface preparation he plans to perform. It is the most time consuming and labor intensive part of a quality painting job. Scraping, sanding, caulking and patching usually represent more than half of the work. Be sure a contractor describes the steps he will take before he picks up a brush. When you have the bids in hand compare apples to apples, i.e., the same grade of materials and the same procedures including the area to be painted, the number of coats of paint to be used, the grade of paint and similar steps for preparation. Before you sign a contract, know that the contract protects both you and the contractor. Get all oral promises in writing and spell out exactly what the contractor will do. If you intend to do some do the work yourself or hire another contractor to do it, write this into the contract. Never sign a blank or partially blank contract. Obtain a copy of the signed contract for your records. The financial terms should be clear and include the total price, time of payments and procedure for canceling. Finally, be sure to ask for a copy of the “Protect Your Family from Lead” pamphlet if your house was built before 1978 and your contractor has been in business since 1999. Obtain a signed letter that you have received the pamphlet. It is the law, but not all contractors or residents are aware of the requirements. Taking the time to plan your project, prepare for the contractor, asking questions and checking references can ensure that your home improvement project is a successful one. This entry was posted in Articles on January 9, 2014 by madmin. The first thing to realize is that restoration is a process. If you can’t afford complete restoration, do a little at a time. What’s important is to move forward. What you don’t finish the next owner will. If we look at ourselves as temporary caretakers of beautiful buildings that will long outlast us, that will give us the correct perspective. The two projects described here, one long-term and relatively expensive, the other quick and less expensive (nothing to do with building restoration is cheap), show the value of the facade beautification. 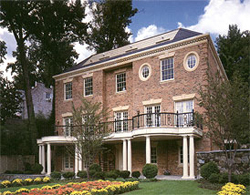 The contractors for the first project, the home of the Audrey and Robert Nevitt at 1000 South Carolina Avenue, SE were the David Mahoney Painting Company and Bricklands brick repair specialists. The Nevitts hired David Mahoney to repaint the exterior of their home; the white paint was peeling badly. The painters began by scraping and washing the brick and then scrapping and washing again to get down to a firm surface. It became obvious that the brick would need extensive repointing. Also the severity of the paint failure led Mahoney to recommend completely stripping down to the original brick and completely repointing. Bricklands, a company which specializes in historic repointing, was called in for this part of the job. It was determined that the original color of the mortar was black. Bricklands matched this and repaired many damaged bricks. Then the David Mahoney Painting Company fabricated some missing decorative details on the facade such as the metal cornices on the windows and the detail work on the cornice. The window frames were stripped and repainted and the security bars were sandblasted and repainted. The project took three months to complete.